Q. Why should we have our records stored and managed off-site? A. Outsourcing your data storage with Hansen Records Management allows you to free up valuable space and focus on what you do best. Hansen provides off-site storage of your documents with a high level of security. Q. What is your price structure on storing data? A. Pricing for storage is based on cubic feet. Levels of pricing are based on volume. Service pricing is based on usage and volume. Q. What makes Hansen stand out from the other professional service companies that store records? A. Our service in providing dependable, secure storage of our customers’ data is designed specifically around each customer’s needs. Family owned and operated since 1904, our integrity is guaranteed. Q. How quickly can I get data stored in your record storage center delivered to our facility when it is needed? A. We are available 24 hours a day, 7 days a week. In an emergency, we can get your data to you within two to four hours. Q. Will I lose control of my documents, paper records or media tapes in your data store? A. To help you maintain control of your records, we will update you regularly on the status of your inventory. Management or inventory reports are available to you free of charge, and you may choose the level of detail you require - box, file, tape, etc. – or if you prefer, you can access a live updated inventory through our secure website. Q. Will you store our data or secured records together in one contiguous area? A. No, your data will be stored using the most advanced barcode tracking/inventory technology software available. O’Neil’s RS-SQL does not scan to a specific location in the records center. For efficiency purposes, we put your data in the first available empty space so that it is not stored in one area exclusively. Our barcode inventory system ensures that your information is stored with the highest level of security. Q. Is Hansen Records Management current with the technological advances in the information service field? A. Our records management software, O’Neil Software, is the best in the industry and is continually updated to maintain that position. Our scan on demand and disaster recovery services are reviewed periodically by our team along with O’Neil to ensure we are taking full advantage of all available updates. Q. Can we use our own document storage boxes for storage of our data? A. As long as they are in good condition you may use your own document storage boxes. Odd size boxes are also welcome. Hansen Records Management also offers quality storage boxes in various sizes for your convenience. Q. Do you have secure records delivery and pickup service? 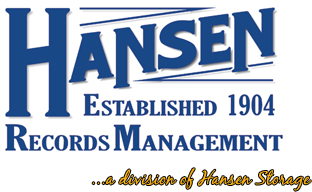 A. Hansen Records Management is a full-service records center that can accommodate all of your pickup/delivery needs. Q. How do I prepare my data storage boxes for secure off-site document storage? Q. Does Hansen Records Management belong to any professional storage organizations? A. Hansen Records Management belongs to and supports the principles of ARMA (The Association of Records Managers & Administrators) and PRISM (Professional Records Information Services & Management). Q. How do I get started for safe and secure data storage? A. Call us at 414-777-1876 or simply complete the online request form here on our website and we will be happy to contact you.